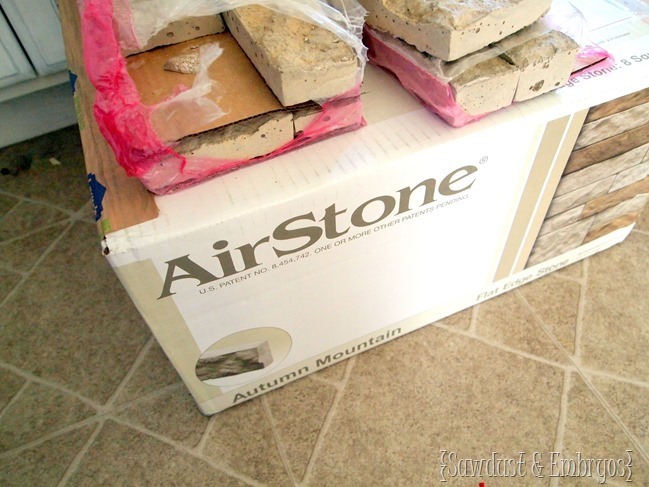 Adding stone to the breakfast bar! 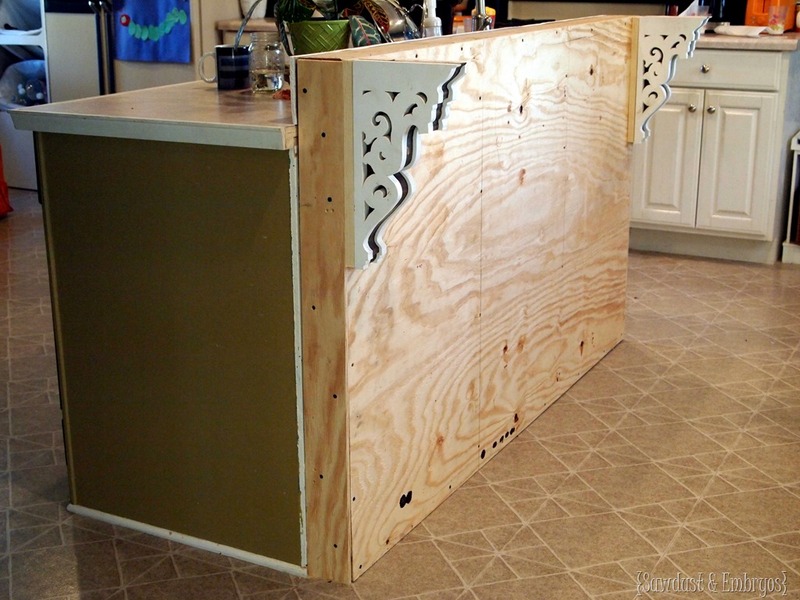 Are you ready for the next step in my Breakfast Bar build? So far, I showed you how I sawed off part of the island and framed a wall, then made my own corbels! A lot of you have been asking me what color I’m going to paint the actual island. I’m guessing there are a handful of people that are worried that I was going to leave it as plywood since I recently wrote this post. But… YOU’RE ALL WRONG! 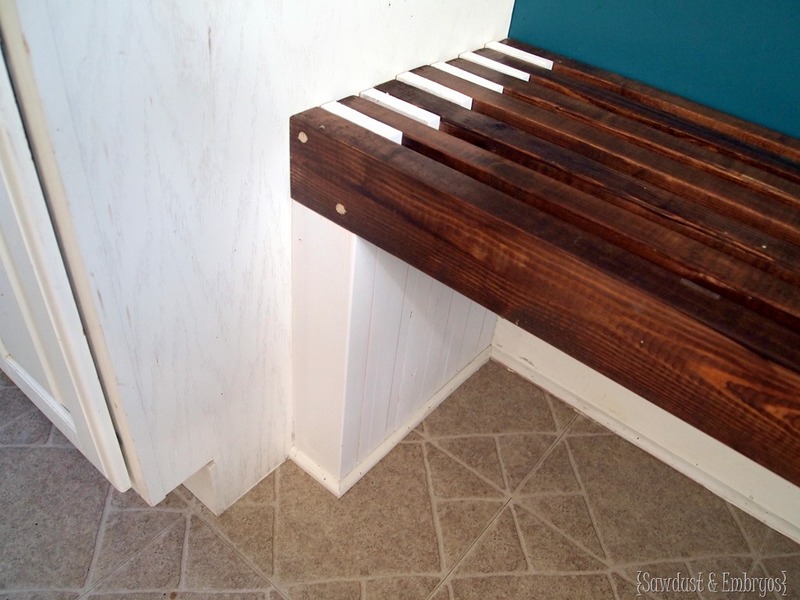 I actually first considered beadboard to add some texture. But that’s a little trendy for me, and I don’t really care for the ‘country’ vibe it gives off. It just ain’t me. So! 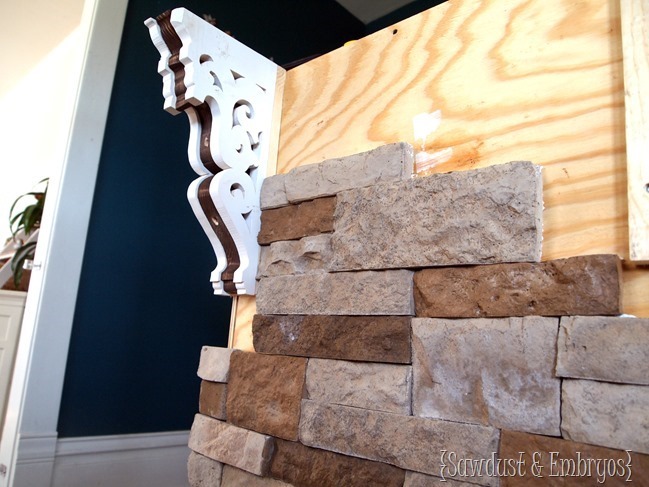 Ever since I saw this awesome stone accent wall (by my friend Ann Marie @ Twice Lovely), I’ve been secretly looking for a place to use this product in my own home. 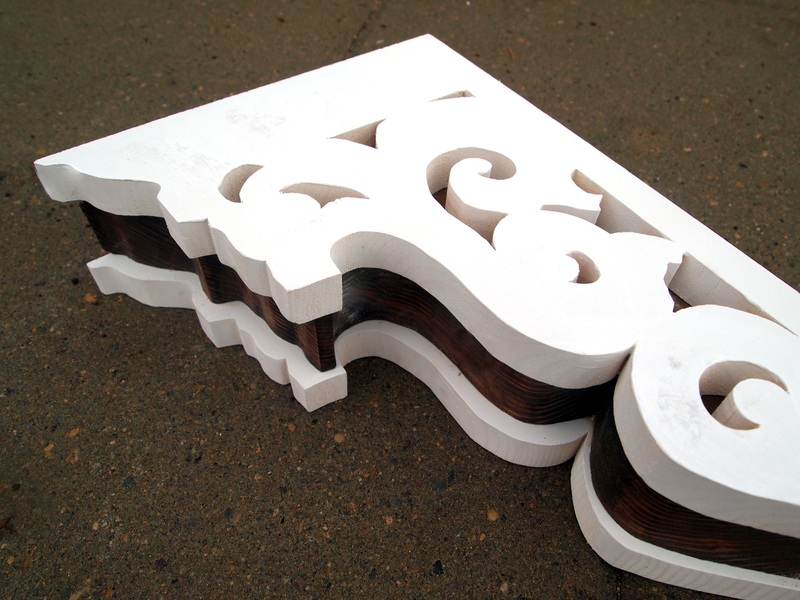 And after standing back and looking at my plywood with decorative corbels, it hit me like a ton of bricks AirStone. 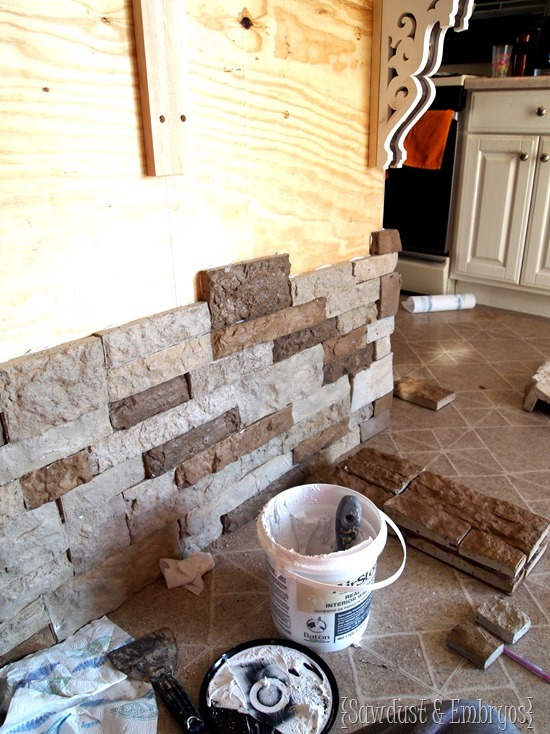 This stuff looks and feels exactly like natural stone… but it’s 75% lighter. And 100% easier to install. This stone is made out of recycled material, and is poured into molds that are cast from actual rock. We just used the pre-mixed bucket o’adhesive, slapped a layer on the back of each ‘stone’ with a putty knife, and pressed into place. Each ‘stone’ is 2” or 4” in height, with lengths of 4”, 6”, 8”, 10” and 12”, so things fit together really easily. The hardest part is trying to be ‘purposefully random’. The corner pieces are my favorite… it’s like they thought of everything! 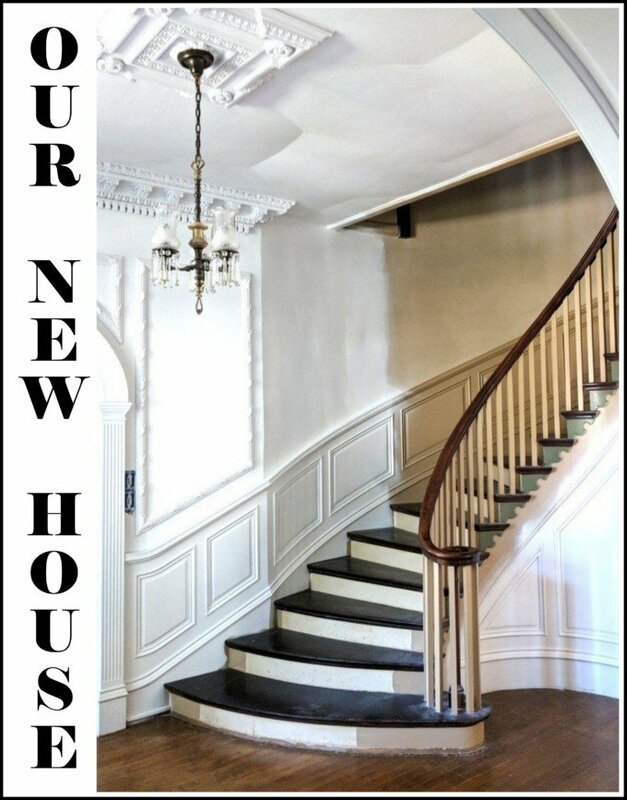 There is some cutting involved, especially if you have to go around things (like my corbels), but you don’t even need to use a power tool! You can just use a simple hack saw. To keep the ‘dust’ to a minimum, Nick went out to the garage to use the band saw or grinder each time I needed one cut. He’s a dear, because getting up from sitting on the floor is no small task these days. What do you think?! SO FANCY! Me thinks I’m going to need to give the rest of the kitchen some TLC so it will all flow… cause right now everything but the island looks a little homeless. The backsplash definitely isn’t working anymore. And I have plans to extend the cabinets up to the ceiling… among other things. Muahaha! Next week, I’ll be back to show you what I used as the countertop! Till then, have an amahhhzing weekend! Disclaimer! We reached out to AirStone and they were delighted to partner with us on this project. While we were provided with free product, we were not compensated monetarily. We just genuinely love their product!! This is STUNNING. 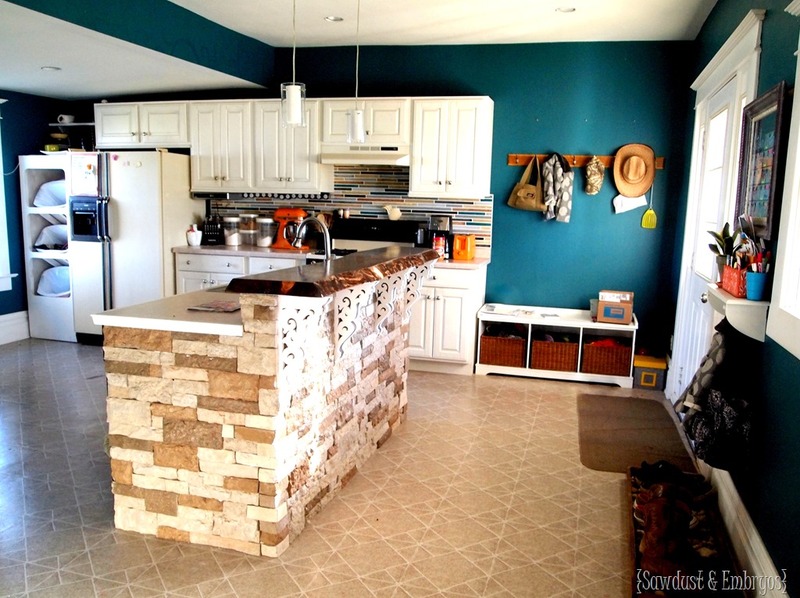 Your kitchen is taking on a whole new custom look. LOOOOOOVE it! 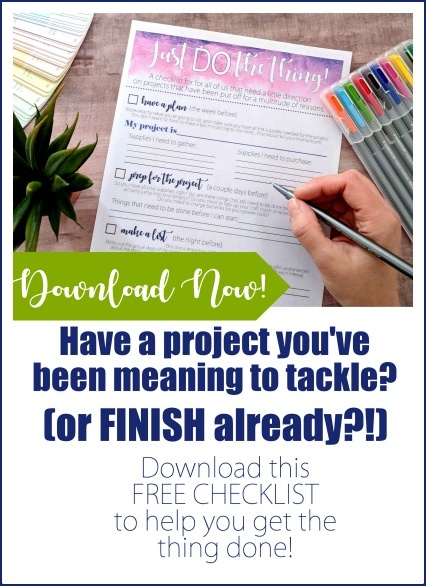 What color did you use for this project? Also did you buy it at Lowe’s? Haha! Great minds DO think alike! I can’t wait for you to see what we actually do with the backsplash! I think it’s going to be awesome! I love this! 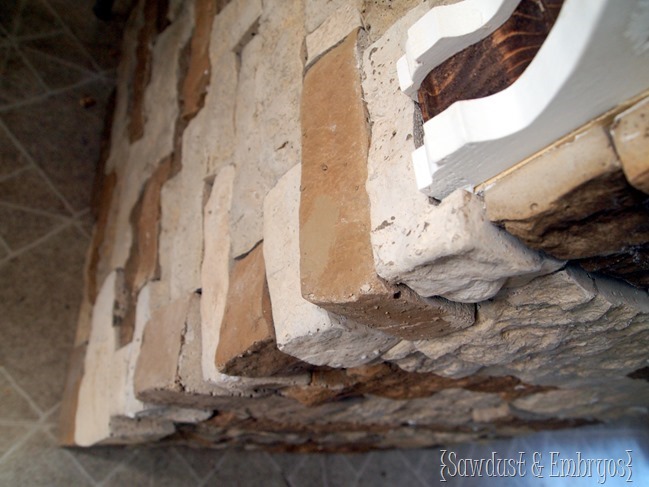 I love the look of stone and it’s nice to know that it can be installed easily at home! I looked up the price and it looks okay! Awesome! The price is the best part! I can’t believe how much ‘natural stone’ is. CRAZY! 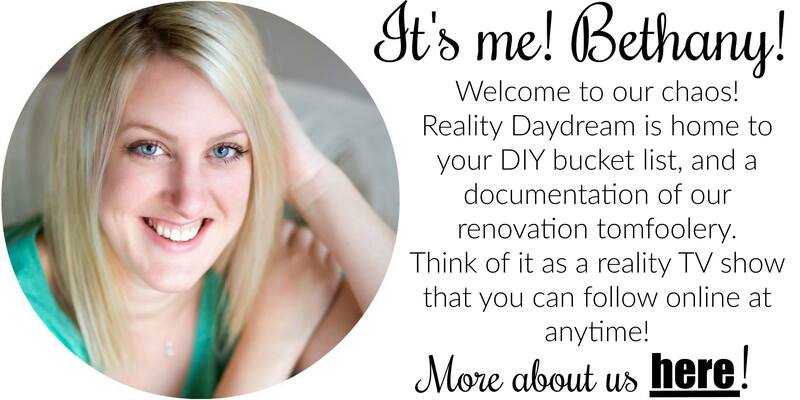 It looks beautiful Bethany…you did an incredible job! eh… I don’t like it….. I LOVE IT!!!!! AWESOME JOB!!!! LOOKS FANTASTIC….!!!! 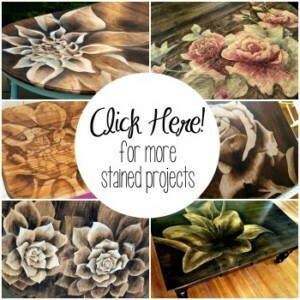 I bet you’ll do some kind of stained wood work for your counter top…!! I LOVE it! My nephew put the same type of product on his breakfast bar in his home. It is just beautiful! 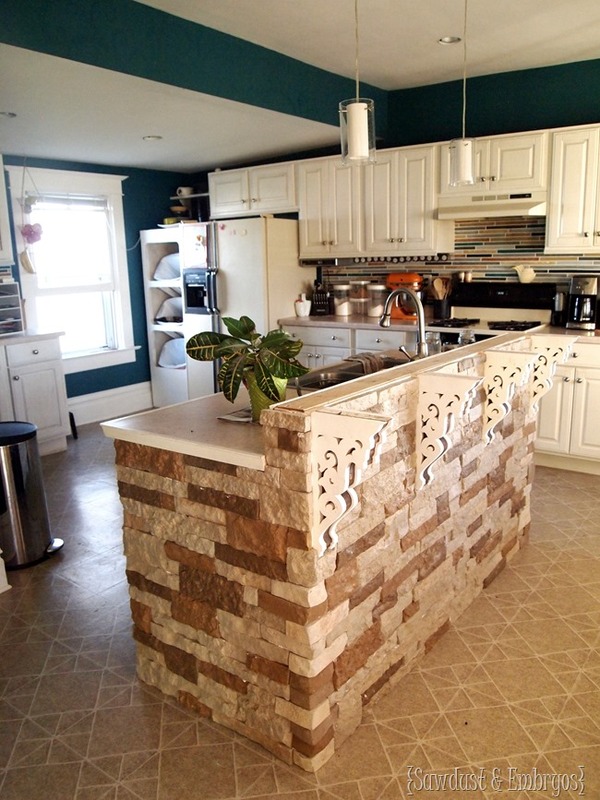 Funny, the first things I thought to myself when I saw the finished product was “that backsplash needs to be changed”. What is that saying about great minds????? 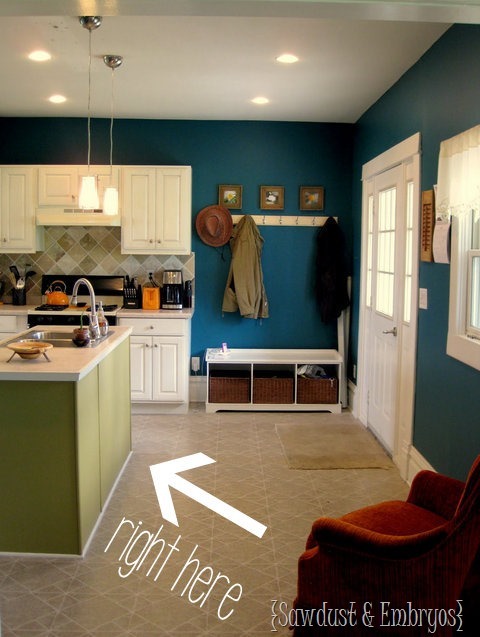 Can’t wait to see the countertop; I am sure you have done something totally different than the rest of us would! That is a good thing!